Interpretations depend on translations which are based on set rules, mapping input into another form of input that is more suitable to processing. Errors in translation will lead to misinformation that will result in not so optimal decision making. These errors can come from ineffective mapping of the atomic elements of one language into another as a result of the differences in the source environments of each language. Differentiation of the levels of granularity or abstraction of the elements of each language, would force abstraction in one language to their closest relative in the other language as perceived by the interpreter and according to his environment, his history, his motives, and his intentions (among others). To effectively communicate, these issues must be acknowledged and communicated so they can be resolved. For a near perfect mapping both (all) involved entities must share experiences of multiple cases to ensure membership of each source. In otherwise, unless you walk on someone else’s shoes there is no way to completely understand what they are saying. While this might be possible, to an extent, with other humans it remains a challenge when one of the parties is another form of life or an inanimate object (like nature for example). This is the basic principle that gives meaning to future. Our existence is part of a continuum and as such it is defined by it context as much as it sustains its existence. Think of it as one person standing on top of another to reach out the fruit of a huge tree. The person at the very top collects the fruits and passed them down the human ladder to feed the rest. The person at the bottom reached a water source and passes water bottles to the top. You are somewhere in the middle philosophizing about your importance. Maybe you should just enjoy the view. Sometimes an argument is made on who is more significant. Should demand for talent dictate an order of significance at a certain time in history. What is the same talent is not necessary at other times in history. Would the person who possess the talent have variable significance. Assigning importance based on significance would then be like fashion trends. Significance is based on by differences even when we are part of a group. If everything was beautiful then beauty would not exist. The perceive differences are the ones that create significance and meaning. The same ones motivate us to be different. In the same way we are part of something so we can share (feed) on its difference from something else. The only way we can matter -meaning we differ - is if we have control. This implies randonmes as a prerequisite at least at the fundamendal leve of choices we can make. It therefore posses the question: can a universe based on randomness exhibit the magnitute of order our univesve displays. Can randomness at one level (say the micro level of choices), leave another level (say the macro level of the physical world) unaffective allowing in this way determinism to rule. This can only happen if the various fluctuations/choices at the micro level cancel out in some way. For example it could be that my success/mattering on Earth results in someone elses loss (of mattering) leaving in this way the human race as an entity unaffected or planet Earth the only affected place. It is unlikelly that the faraway galaxies are affected in any way by the human race or Earth for that matter (that thought my suggest that physical laws might be different in other places/universes). So, my freedom of choice/change is only limited by the total potential of my unic of existence. A duality seems neccesssary if freedom of choice is going to exist. Two worlds (micro and macro or this life and the after- life) coexist - one as a atomic/indivissibe entity of the other. Suppose you spend all your life trying to find the meaning of life. This presumes of course that you are capable of finding it under the right conditions. By definition though the meaning of life is what makes life worth living so if you are searching for the meaning of life you are definitely not living life unless the meaning of life is to search for the meaning of life. So, searching for the meaning of life is worth it if searching for it is the meaning of life in which case you have already found it as you are doing it (living your life according to the meaning of life). If, though, searching for the meaning of life is outside what life is then you are searching for something somewhere it doesn’t exist. This makes the act of searching for the meaning of life lifeless which is a contradiction. If the meaning of life existed with life it should be findable and the act of finding it should be part of it or actually all of it. It like the process of proving rationality. It is irrational simply by not being included in the rational because a system cannot prove itself from within. Why do we try to see in the dark if we can't? Because we want to force the dark into becoming so we can make sense of it. But that would be like a blind person spending all his life trying to see instead of just living in the dark. When it comes to the meaning of life we are the blind. We don’t have that sense. We have so many others, though, that can make living in the dark quite a living. If I leave in the moment I don't need a past or a future. I don't want to live in the moment. It is so restrictive. I want to live every-time, past, present, future - from the beginning of time to the end. A huge distance in time so that I will never be able to keep all of it in my mind, so that every instance of me could experience the joy and awe of exploring and experiencing something new. A perpetual search for satisfying my bottomless pit of fulfillment. Living in the moment is pathetic. It is like numbing your senses and submitting to everything that comes. Considering +dt and -dt is probably better (like in fuzzy logic) because at least you have some frame of reference (the -dt) and a goal to work on (+dt). Change will be the revelation of the future. Statistically, based on student excusses, people's relatives (especially the elderly) die more ofter before deadlines than any other time. God didn't design the world to perfection or under his full control. He left a level of uncertainty to allow room for creativity. Also, he can’t be sitting down and enjoying his creation. If he bothered building the universe you would want to be part of it (at least where the action is), actively engaging, inspired and amazed by what comes out of it. Stories are popular because of their affiliation with reality. They repeat elements of our established and desirable reality. Our realities are our axioms and can only prove theorems about them. The possible combinations of all our realities that we could ever discover there can be no more that realities within that system. If God exists it has to by definition be more than anything we can possible, imagine through our limited realities. Proving its existence is impossible. What is possible, though, is the existence of realities beyond our understanding. These of course are irrelevant to us as they can never be experienced or perceived in any way. In this respect believing is God can only serve as ideal in a Platonist sense, and as such it can guide in the development of a purpose. We can never know what to want because our limited life does not allow us to compare with alternative lives that could enforce by repeatition a reality that we will desire. So our first rehearsal is also out opening and closing performance. No time to write and test the script. Given the option to live in a world you cannot control and one you can most people will choose the one they cannot control simply nothing is worth having in a world that you control because you will never know if you deserve what you have. This notion of worth is vital in defining individuality. I want to know (even if it is an illussion) that I earned my reality. This is where vissibility comes. The more others recognise us the more alive we feel (as a confirmation of fulfilling our purpose). One possibility could be the we identify as conciousness is simply the identification of sources of signal that come from within the brain and not the exterior. The exterior sends signals to the brain continously. Unless a signall passes a certain thresshold it will not activate the flud of signals the different areas of the brain will send to each other. When it passes the thresshold I become aware of primary information different areas send in respond to their synchronous activation. When I fall asleep for example I raise the activation threshold so even active signals like in dreams do not cause the global activation that will wake me unless of course I see a nightmare or someone yells at me to wake up (the intensity of the sound breaks through). Initial signals are at level Li (blue in the image) producing a total flow of Sum(Li). When Sum(Li) > Threshold(L) then groups of neurons fire synchronously in the same direction. This current obviously create magnetic field that triggers surrounding neurons to fire probably in directions that alleviate the current (or maybe strengthen it in another direction). These supercurrents (brown color in the image) quickly pass from area to area triggering responses that will drop the current which result in other neurons firing and creating physical reactions (I raise my arm for example). 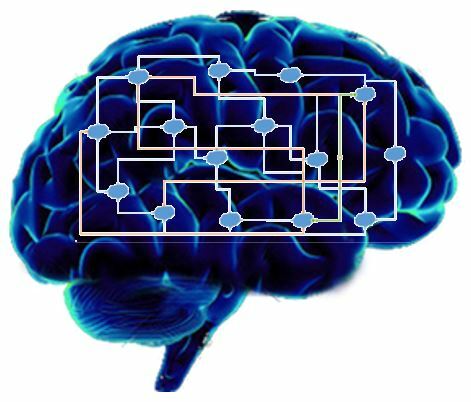 The reaction signal or otherwise the countercurrents are registered in the brain as internal signals abstracted under the label consciousness. The repetition of signals create in the brain What I interpret as reality. At another level (green color) we might have the impression of us thinking that we are thinking. It sounds like swarm intelligence where the various parts of the flock create micro-swarms that occasionally influence other areas. Short range influences (microswarms) when synchronized will result in long range influences (consciousness). How then two individuals (groups of swarms) will be able to communicate. 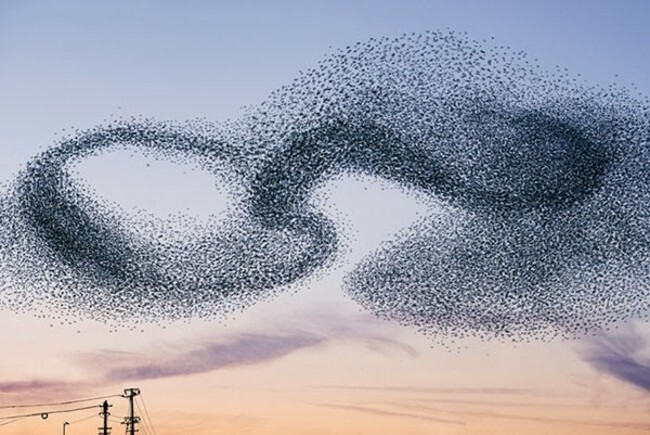 Imagine a swarm of birds synchronizing its various areas to perform a flight pattern like a horizontal eight 00. If the other individual is a random pattern, then its various magnetic fields will cancel each-other. The 00 though will produce a pattern that could persist over distance and start affecting the random resulting in maybe @@. The two individuals are now talking to each other. If the two adopt a cooperative formation (sustainable pattern over time) they might start affecting others so we start seeing communication resulting in interaction - eventually resulting in communities and the development of culture. Here is another analogy. Suppose there is a vehicle that you can’t see inside. You see it driving through the road avoiding obstacles, anticipating other vehicles moves, communicates its intention with other vehicles through signals and interprets other vehicles signals. It seems to possess memory as it avoids a groove on the road that fell in the last time it drove in the same road and slowed down in anticipation of a bump in another part of the road. Every now and then the vehicle stops and refuels. Because you have seen people coming in and out of vehicles before they move and after they stop you conclude they must have something to do with the driving of the vehicle. Obviously, since they don’t puss it or pull it from the outside they must be in control of it. If various people get in and come down at various points it would be natural to conclude the vehicle is used for some kind of transport. What if though, if no one is getting in and out. The vehicle becomes a body, an organization, a new species. Apparently whatever is inside collectively decides to move the vehicle in some direction. One of them moves the steering wheel, another looks at the road ahead, another keeps track of the places they have been, another one listens to the beeps from the other cars, and so on. The entities, while specialized, they can easily acquire the expertise of each other so if one of them dies another one can compensate for the loss to an extent so basic functionality is preserved. When all of them die the vehicle. Dies. When the vehicle crashes they all die. The entities inside see other vehicles moving around and since they can’t see inside of them they come to the conclusion that the vehicles are one entity. Since they are in a vehicle too they deduce they are one and not separate entities. How can then they explain the communication between each other. They device a name for it, consciousness. Problem solved. Well, except for some of the vehicles that are called philosophers. Is the survival of the spices more important than the survival of the individual? If the answer is “yes” there are interesting moral implications to follow. If on the other hand the answer is “no” then maximizing personal wealth and satisfaction should be the core obligation of each individual. Although this latter option might sound too selfish it could still produce cooperative societies that thrive by exhuming natural resources. Even when there is shortage of natural resources these societies can prosper as long as they can trade with other societies (in essence cooperatively exhume greater physical areas) or dominate others through power. Through friction, revolutions and wars one would expect competing societies to eventually deplete their human resources creating more space for the remaining populations to thrive. As long as the natural resource can provide for some portions of the population the war and peace situation will perpetuate. Considering the altruistic answer to our question the growth and sustainability of our civilization becomes an ultimate priority. For this to be achieved and people do not start killing each-other a sense of fairness becomes necessary. One assumption is here important. Fairness of natural phenomena is meaningless. Fairness exists in social settings and it has to do with accessibility to opportunity and resources that will allow someone to grow. It has very little to do with equality in the sense we are used to talk about it. Here is where things get interesting. We are all born with different potential and capabilities. We are born with different DNAs. Given this inherent difference among individuals, equality as a social construct can only refer to the availability of opportunities for a specific function and activity. Different DNAs suggest different potential and subsequently different possibilities and outcomes for everyone. Someone who is not privileged with abstract thinking and counting abilities will never become a top mathematician no matter the resources (tutors, time, books, etc) available to him. Let us say an individual i at time t in a country c has potential ability Pisct for a specific subject s. This potential is available for him to use if he chooses to do so. His only imitation for achievement comes from his motivation or will Wist at the time and the availability of opportunities Osct available for materializing such potential. Given the influence of potential and will might have we can define a new variable that we will call denatotita (the Greek word for potential). We presume here than an excess of denatotita from fulfilled subject counters unfulfilled subjects. * In a non-denatocratic society (communist, socialist, etc) everyone is afforded the same opportunities regardless of their abilities and will. For example, everyone should be allowed to become a surgeon. It is obvious that this type of society will no grow much as most of this opportunity will be wasted to the wrong people. Very few will have the potential and will to advance. In addition, the breakdown might not be sufficient for even those that qualify to reach the limit L_surgeont to realize the opportunity. which it can redistribute to the failed one to allow for some to pass over the limit. All of the above for the denatocratic society presume the society has the insight to know its present. A denatocratic society with foresight should be able to see which opportunities are of strategic importance that when realized provide multiple benefits and maximize the and distribute its accordingly. A denatocratic society with hindsight will distribute the residual opportunities according to the and its . We shouldn’t forget, of course, that some opportunities are inherent in the structure of the society and the situation at a given time and have nothing to do with the centralized authority that distributes opportunities. Entrepreneurs are often-times individuals that identify and exploit such opportunities. Another aspect that needs to be addresed in the influence on the decision making. To preserve the "fairness" of the denatotita voting whoyld be weighted according to the voters denatotita. This way the posibility of a total idio casting an equal vote with a real contributor is eliminated.